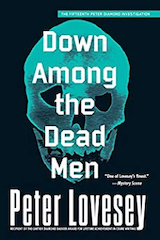 Down Among The Dead Men was published in July 2015 by Sphere in the UK and Soho Crime in the USA. A nightmare discovery in the boot of a stolen BMW plunges car thief Danny Stapleton into the worst trouble of his life. So what links his misfortune to the arrival of charming art teacher Tom Standforth at a private school for girls in Chichester? In the local police, a senior detective is accused of misconduct and another force is called in to investigate. Orders from above propel Peter Diamond of Bath CID into a situation that has him reluctantly dealing with spirited schoolgirls, eccentric artists and his formidable old colleague, Hen Mallin. 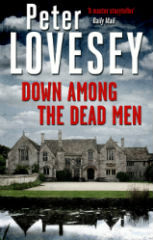 Multi-award-winning author Peter Lovesey returns with a twisty tale that will delight fans of the series and draw in anyone who loves pitch-perfect traditional British crime fiction.